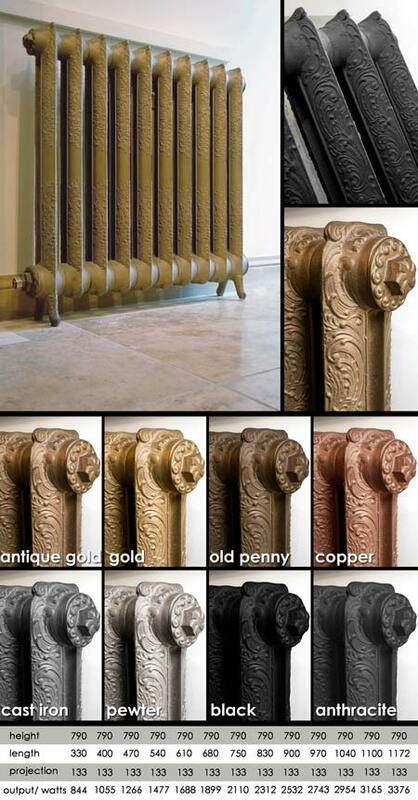 The Rocco traditional cast iron heating radiator has a beautiful ornate design caste into the radiator. This slim ornate radiator is new and is an exact copy of the original cast iron radiator. All or Victorian radiators are 790mm high x 133mm deep and supplied in varying lengths. These traditional styled radiator can be supplied in primer for on-site painting or pre-painted in 8 colours to special order (please allow 3 weeks) Bespoke radiator colours are also available on application. * New cast iron radiator. * In primer and 8 colours.